* Stainless steel patented foam insulated cover keeps pans colder to lock in freshness. * Adjustable, heavy duty, vinyl coated wire shelves (not available in drawered sections). * Extra-deep 19-1/2" full length removable cutting board included, height from floor, 36". * Standard (1/3 size) 12'x6"x6" clear polycarbonate insert pans included (positioned on countertop). Also accommodates four and eight inch deep pans. (drawered models will not accommodate 8" pans). * 5" diameter castors standard equipment (legs available). 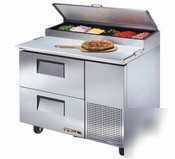 * Drawered Models accommodate two 12" x 20" x 8" pans per drawer (not included). * Door models accommodate half bun tray rack; applies to only one door of TPP-60 (18" x 26" sheet pan) - not included. * Garnish rack and service shelf optional (garnish racks are not available on TPP-60, TPP-60D-2; service shelf is not available on TPP-119. One Year Parts and Labor Warranty.Additional Four Year Compressor Warranty.